A unique gift from the Dingle Peninsula in Ireland. Ideal for anyone passionate about herbs, cooking or gardening. 160 pages in full colour throughout, thread sewn with a laminated finish making it durable and very user friendly. Ideal for anyone interested in growing and using herbs. “Greta’s charming and beautifully illustrated book will be a source of tremendously useful advice, knowledge and inspiration for all who wish to grow their own herbs.” Rory O’Connell, Co-founder of the Ballymaloe Cookery school, TV presenter of ‘How to Cook Well’ and award winning author of ‘Master it’. 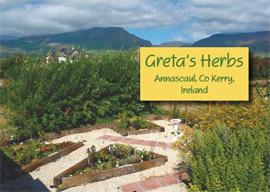 “From the practicalities of propagation, cultivation and harvesting to the many ways in which culinary and decorative herbs enrich our lives, ‘Greta’s Herb Book’ is a great ‘hands-on’ introduction to the world of herb growing, written by an experienced horticulturist and nursery-owner who knows her stuff.’ Fionnuala Fallon, The Irish Times gardening correspondent, horticulturist and author.